On Wednesday the Times of London published a much-cited article about this week's blast in Isfahan. The article referred to the bombed installation as a "uranium enrichment facility." But there is no uranium enrichment facility at Isfahan. Rather there is a uranium conversion facility. As the news analysis website The Missing Peace explained, a UCF is an installation where yellowcake is converted into uranium hexafluoride, or UF6. In Iran, the UF6 from Isfahan is sent to Natanz, where it is enriched. While Isfahan's UCF may be a reasonable target in an all-out attack on Iran's nuclear program, it is not a vital installation. According to American military analyst J.E. Dyer, it would not be a priority target for Western governments whose primary goal is to neutralize Iran's nuclear weapons program. "Western governments make their targeting decisions based on criteria that would put the Isfahan UCF several notches down the list of things that need to be struck in November 2011. It's a workhorse facility in the fissile-material production network, and it's already done what needs to be done to assemble an arsenal of multiple weapons. Uranium conversion is also 'mastered technology'; Iran can reconstitute it relatively quickly." If Dyer is right, and the Isfahan site is not critical to Iran's nuclear project and was therefore not attacked by a Western government, who attacked it and why? Dr. Michael Ledeen, an Iran expert from the Washington-based Foundation for Defense of Democracies wrote Monday at PJ Media that the attack at Isfahan, like the attacks two weeks ago at the Bidganeh Air Force base and two other Revolutionary Guards bases were conducted by members of Iran's anti-regime Green Movement. In those attacks, Revolutionary Guards Maj.-Gen. Hasan Tehrani Moghaddam was killed and some 180 Shahab 3 ballistic missiles were destroyed. Speaking to The Missing Peace, Daniel Ashrafi, an Iranian anti-regime activist living in Canada, claimed that Supreme Leader Ali Khamenei was scheduled to visit the Bidganeh base at the time of the explosion, but he was delayed. If true, this would mark the second time that a facility was bombed when one of Iran's senior leaders was scheduled to visit the site. In May, the Abadan oil refinery was bombed during a site visit by Iranian President Mahmoud Ahmadinejad. In the case of the Green Movement, what began as a protest movement after the regime stole the 2009 presidential elections, morphed in the ensuing months of protests and regime repression into a full-blown revolutionary movement. No longer content to demand that Ahmadinejad step down and fair elections take place, the Green Movement began calling for and working towards the overthrow of the regime as a whole. And since last year, regime installations as well as key members of the Revolutionary Guards have been targeted on a regular basis. As The Washington Post reported last week, since 2010 there has been a fivefold increase in the number of explosions at Iranian oil pipelines and refineries. Whoever is behind the blasts is clearly targeting Iran's high value economic assets. This escalation in the war of sabotage against the Iranian regime provides two important lessons for Western policy-makers assessing Western options for preventing Iran from acquiring nuclear weapons. It tells us the popular Western belief that a US or Israeli or coalition strike on Iran's nuclear installations would provoke the Iranian public to rally around the regime is utter nonsense. In the case of the Isfahan bombing, for instance, there are two possible scenarios for who is responsible. First, it is possible, as Ledeen argues and Dyer infers, that the attack was the work of regime opponents acting on their own. Second, it is possible as Israeli officials quoted by the media have hinted that it was a collaborative effort between local regime opponents and foreign forces. At the height of the 2009 Green Movement protests against the regime, US President Barack Obama justified his decision not to side with the anti-regime protesters by claiming that if the US were to support them, they would lose popular credibility. In his words, it would be counterproductive for the US "to be seen as meddling" in Iran's domestic affairs, "given the history of US-Iranian relations." And yet, what we see is that no one is rallying around the regime. 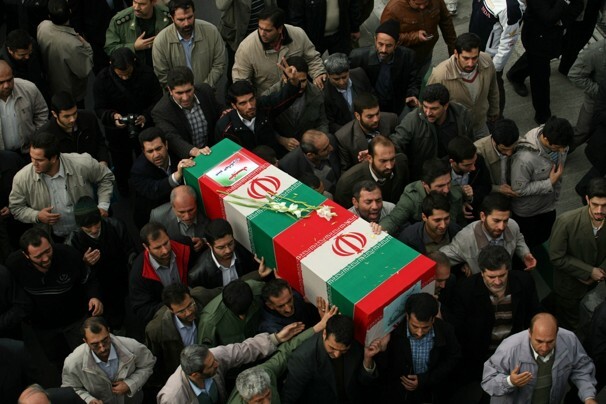 The attacks on Isfahan and Bidganeh, which the regime was quick to simultaneously deny and blame on foreign governments, did not cause the people to rally to the side of the mullahs. So, too, the repeated bombings of petroleum facilities are not fomenting an upsurge in public support for the regime. To the contrary; domestic disgruntlement with the regime continues to rise as the standard of living for the average Iranian plummets. And this brings us to the "students" who raided the British Embassy on Tuesday. On Thursday the regime released from jail all the "students" arrested for raiding and torching the embassy and briefly holding British personnel hostage. Their release is yet further proof that the embassy attackers were neither students nor angry at Britain. Rather, as British Foreign Minister William Hague and others have alleged, they were regime goons who belong to the same Basij force that massacred, tortured and raped the anti-regime protesters from the Green Movement in 2009. And as Obama's statements in the wake of the assault on the British Embassy made clear, he still fundamentally misunderstands the situation in Iran. Responding to the attack, Obama said, "I strongly urge the Iranian government to hold those who are responsible to task." That is, the US president opted to pretend that "those responsible," were separate from the regime, which they are not. Obama's response is of a piece with his non-response to Iran's plan to bomb targets in Washington. It is also in line with his refusal to contemplate sanctions against Iran's Central Bank and its oil sector. Moreover, Obama's continued insistence on working through the UN Security Council to ratchet up sanctions on Iran despite the fact that Russian and Chinese support for Iran has blocked that venue make clear that he is not at all serious about using US power to prevent Iran from acquiring nuclear weapons. Whereas the Obama administration peevishly argues that an embargo on Iranian oil will raise world oil prices, this week the British openly called for an embargo on Iranian oil. In truth such an embargo would harm Iran far more than it would harm the global economy. Europe buys 20 to 25 percent of Iran's oil exports, but Iranian oil makes up only 5% of European oil imports. At least in the short run, Saudi Arabia could pick up the slack, thus ensuring stability in global oil prices. There are many opportunities for collaboration between these forces. In an interview with The New York Times following the UN's International Atomic Energy Agency's report exposing Iran's nuclear weapons program last month, Jean-Jaques Guillet, who published a report on Iran for the French National Assembly, said the goal of these forces should be to overthrow the regime. In his words, "If we press the regime strongly, there could be an implosion. The real objective these days should be the regime's implosion, not more talk." Cutting off regime broadcasts, placing an embargo on Iranian oil exports, and actively assisting anti-regime forces in sabotaging regime installations, including nuclear installations, have the potential of achieving the goals of preventing Iran from acquiring nuclear weapons and facilitating the empowerment of pro-Western democrats in that country. Clearly, US participation in such a collaborative strategy would be helpful. But between the explosions in Isfahan and Bidganeh, and the surge in attacks on other regime targets; and Europe's notably robust response to Iran's attack on the British Embassy, it is possible that these goals can be accomplished even with the US following far behind.